Nearly 10 percent of people in the US have some degree of hearing loss. Hearing loss can be congenital or acquired, progressive or sudden, temporary or permanent, affect one or both ears, and be mild or profound. 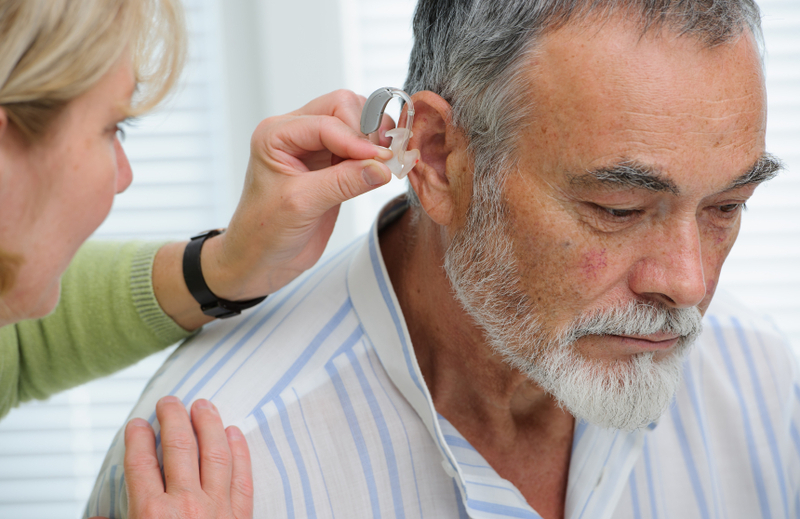 Aging, infections, head trauma and accumulation of ear wax can all contribute to hearing loss. Even newborns can have hearing loss and are tested. Hearing problems in early childhood can result in lifelong impairments in learning and language skills. Children who have other sensory, linguistic, or cognitive deficiencies are affected most severely. Adolescents are at risk from excessive exposure to noise, head trauma, or both. Older adults typically experience a progressive decrease in hearing which is usually related to aging and noise exposure. The Audiology and Hearing Aid Center at Riddle Hospital offers highly sophisticated options in hearing aid technology, including superior noise reduction, wireless streaming from electronic devices, and responsiveness to the user’s sound environment. If you or someone you care for has hearing loss, an audiologist can measure hearing function with appropriate tests. If the cranial nerves are involved, you may need additional imaging tests such as an MRI (magnetic resonance imaging) or a CT (computerized tomography) scan for the ENT to make an appropriate diagnosis and treatment plan. Why Main Line Health for your hearing services? Main Line Health has doctorate-level audiologists who can assess your hearing and evaluate any hearing loss. If you have hearing loss, we can prescribe, custom fit and service your hearing aids, with technology ranging from the basic to advanced computer programmable digital devices. We offer the latest testing to evaluate your condition and create a customized treatment plan for your individual needs. Physical examination – The external ear is inspected for any blockages, infection, congenital malformations, and other lesions. The eardrum is examined for perforation, drainage, inflammation, fluid or masses. The cranial nerves are examined during the neurologic portion of the exam. Pure tone audiometry (PTA) – This test uses an audiometer that plays a series of tones that the person can hear through headphones. The frequency and loudness varies. Speech reception threshold (SRT) – one of the most important screenings you will have when you go in to see an audiologist for a thorough and comprehensive screening. This process tells the doctor if you have any lost ability to hear as well as what type and what extent it is at. Generally, you will be asked to repeat two-syllable words during this screening. You will hear the word and then need to repeat it. However, the sound and intensity of the sounds you hear will rise and fall throughout the screening. The goal is to find the softest level at which you are able to repeat at least half of the words presented to you. Word recognition (formerly called Speech discrimination) – assesses how well you understand words used in normal conversation by repeating a series of one syllable words that are louder than your speech reception threshold test result (loud enough you will not have any problem hearing the words). Weber Test – determines whether an issue is conductive or sensorineural hearing loss. Conductive hearing loss occurs when sound waves are not able to pass through the inner ear. This can be caused by an infection, a buildup of earwax, a punctured eardrum, and fluid in the middle ear. Sensorineural hearing loss occurs when auditory nerves or hair cells are damaged in the inner ear. This is also known as "nerve deafness," and it is caused mostly by aging. Rinne test – compares air- and bone-conduction hearing. Air-conduction hearing occurs through air near the ear, and bone-conduction hearing occurs through vibrations. Tympanometry – aids in diagnosing and monitoring problems with the middle ear and measures the ear’s response to both sound and pressure. This test can help determine if the hearing problem is a result of fluid in the middle ear, ear infection, a tear in the eardrum, or a problem with the Eustachian tube that connects the middle ear to the upper part of the throat. Acoustic reflex measure – provides information about the possible location of the hearing problem by testing response to sound by the contraction of a tiny muscle in the middle ear. The loudness or absence of sound tells the audiologist about the type of hearing loss. Static acoustic impedance – measures the physical volume of air in the ear canal. Helps identify a perforated (torn) eardrum. MRI of the head in patients with an abnormal neurological evaluation or those with poor word recognition in the audiology testing. Magnetic resonance angiography is done when there are vascular abnormalities. CT scans are done if a bony tumor or erosion is suspected. The auditory brain stem response using surface electrodes to monitor brain waive response to sound stimulation is conducted when a patient does not have another way to respond. Electrocochleography measures the activity of the cochlea and the auditory nerve with an electrode placed on or through the eardrum. It can be used to assess and monitor patients with dizziness, can be used in patients who are awake, and is useful in intraoperative monitoring. Otoacoustic emissions testing measures sounds produced by outer hair cells of the cochlea in response to a sound stimulus usually placed in the ear canal. It is used to screen neonates and infants for hearing loss and to monitor the hearing of patients who are using ototoxic drugs (eg, gentamicin , cisplatin). Central auditory evaluation is done when patients seem to hear, but do not understand such as when they may have difficulty understanding speech in noisy environments, following directions, and discriminating (or telling the difference between) similar-sounding speech sounds.